Botswana is situated in Southern Africa and landlocked by South Africa, Namibia, Zambia and Zimbabwe. It covers 600 370 square kilometres and is home to only two million people, making it one of the most sparsely populated countries in the world. The largest city and country capital is Gaborone, with Maun and Kasane the gateways to the wildlife. 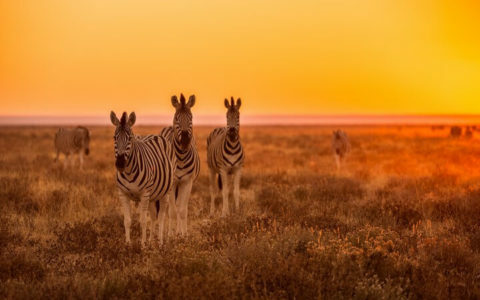 Botswana is known for its remote and unexplored national parks and wildlife areas, to the green lush riverbanks and canals of the Okavango Delta. The Chobe National Park covers 11 700 square kilometres of flora and fauna, which can easily be accessed from Kasane. The Park is home to the ‘Big 5’ and especially known for the Chobe River Sunset Cruise which offers extraordinary game viewing opportunities. Another well-known National Park is the Moremi National Park which was voted in 2008 as the ‘Best Game Reserve in Africa’ by the African Travel and Tourism Organisation. The area is situated in the central and eastern regions of the Okavango Delta, including the Moremi Tongue and chief’s island, boasting one of the most wonderful and varied ecosystems of the African continent. Botswana also has the largest inland delta in the world, the Okavango, which leads into the barren sand areas of the Kalahari Desert. The Delta is fed by the Okavango River which comes all the way from the Angolan Highlands. While cruising through the calm waterways of the Delta on a local dug out canoe (mokoro) from wetland to dryland, look out for the african bush elephant, african buffalo, hippopotamus, blue wildebeest, giraffe, nile crocodile, lion, cheetah, leopard, black rhinoceros, white rhinoceros and so much more.